It doesn’t take long with a strained rotator cuff to realize how important the shoulder joint is to nearly every move you make. When shoulder pain gets you down, here’s a rotator cuff rehab guide that will help you recover – and quick. Waking up with serious pain after sleeping on your side? Maybe you’re feeling a little stiff and weak in the shoulder? You might try to brush it off. Then one day at the gym, you load up with your usual weight for overhead press and get into position. As soon as you lift the weight overhead, the arm on the side that’s been bothering you almost gives out. Not only do you feel a jab of pain, but total weakness, too. You have to strain to catch the weight before it falls down and slams into your shoulder. Yikes. That was close. These symptoms all point to one thing – a strained rotator cuff. Your shoulder is a ball-and-socket joint that is formed where the “ball” of your humerus head and the “socket” of your scapula’s glenoid cavity come together, hence the name “glenohumeral”. The glenoid cavity is quite shallow, and while the joint allows for a great deal of mobility, as with anything the greater something is designed for mobility the less the stability – this is known as an inverse relationship, btw. Because of this, it must depend on surrounding musculature, including the rotator cuff, to provide support. Your rotator cuff is made up of the supraspinatus, infraspinatus, subscapularis, and teres minor muscles, which all run from your scapula to your humerus. The name rotator cuff implies that these muscles are all about rotation. And yes, that’s true – but only to an extent. Your rotator cuff muscles do work to rotate your arm both internally and externally, and to lift it. But their real function is DYNAMIC stabilization of the humeral head in the socket. . Without the stabilizing force, there would be no point to rotation, as it wouldn’t take much movement of the humeral head in that shallow glenoid cavity to dislocate your shoulder joint. Your rotator cuff is at work during overhead movements of all kinds – including the swing of a tennis racket, the stroke while swimming and the overhead lift of a set of weights . 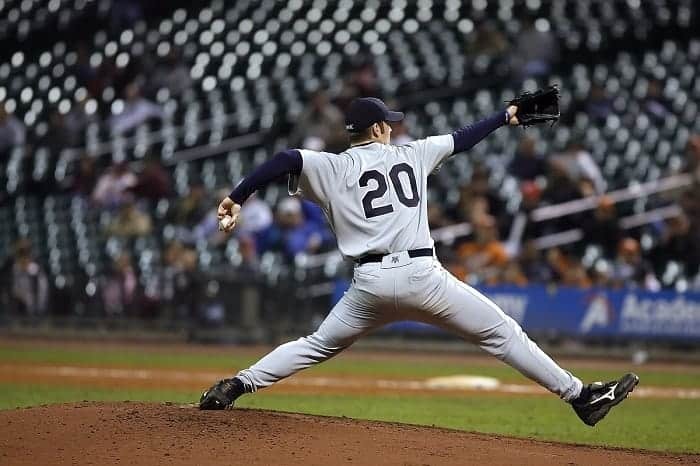 It isn’t only working to stabilize, rotate and lift your arm during these activities – it also works to accelerate and decelerate your arm during high velocity movements, like pitching . … you’re at risk for a strained rotator cuff! There are many different classifications used for rotator cuff tears simply because of the complex nature of the area. There are 4 muscles involved and any one (or a combo of several) can be affected, all to different severities. The most common and straightforward way to classify rotator cuff injuries is by considering the depth of your tear or strain. In Grade 1 strains, the tear is only up to 3 millimeters deep . In Grade 2 strains (or partial tears) the tear is 3-6 mm deep, or less than half the thickness of the involved tissue. In Grade 3 strains (or full tears) the tear is 6mm deep, or more than half the thickness. So how do you, on your own, tell A) if you have a rotator cuff strain and b) how severe it is? Basically, it’s down to how intense your pain is and how much mobility you have. There are a couple of tests that can help with this (which we’ll dive into in a moment), but also some symptoms you can consider. If you have mild pain in your shoulder, hear clicking when you elevate it and feel weak when reaching to the rear or overhead – but are still ABLE to move in these ways, you probably have a Grade 1 strain . If you have a Grade 2 tear, it is likely very difficult to lift your arm, and the pain is significant. If you have a Grade 3 strain, you probably can’t lift your arm at all, or even lift the elbow away from your torso . If these Grade 2 or 3 symptoms are sounding familiar, you should seek medical help and get diagnostic imaging done. These are significant injuries that require one-on-one treatment to heal properly. But, if you think you have a Grade 1 strain, proceed with my 7 steps to rehab. There are a couple of tests that suggest which muscle is torn. These allow you to better understand the nature of your injury, plus can be used as marker to test your progress as you start to heal. The Drop Arm Test is done by abducting your shoulder to reach the arm up. Start to lower your arm slowly, all the way to the side of your body. If your arm drops down without control once you get past 90°, your supraspinatus and/or infraspinatus are probably involved . You’ll read more about how to rehab a supraspinatus injury in this article. For the Lift-off Test, bend your elbow to place the hand of the affected side on your lower back. Keep your wrist straight as you try to lift your hand off. If you’re unable to do so, your subscapularis is probably injured . To test for Hornblower’s sign, reach your arm out in front of you, with your elbow bent to 90° and fingers pointing up. Try to externally rotate your shoulder. If you feel weak, feel pain, or are unable to do so, your teres minor is likely strained . I was consulting with an avid CrossFitter who hired me because of shoulder pain that he’d been experiencing for a couple of months. Then I asked him what he’d been doing since. “Have you still been snatching?” I asked. While this advice isn’t the gold standard of medical care, if you can clearly identify the time and mechanism of injury, it’s wise to avoid that thing at least in the acute stage of the injury (3-10 days for most minor muscle strains). The thing with rotator cuff strains is that while they do happen from doing snatches with crappy form and mobility; or staying on the mound an inning too long to pitch a complete game, they more often sneak up on you, making the identification of the exact time and mechanism of injury impossible because there isn’t one. In this case, the only way to not just quickly rehab but build your shoulders in a way that prevents a strained rotator cuff in the first place is to follow the 7 steps below. Don’t be like my client and stick with those snatches if you think they’re behind the injury or if they’re causing pain. This rule goes for stretching too. Even though many folks use stretching as their go-to recovery move, you’ve got to be smart about it. Avoid aggressively stretching your shoulder – especially if it provokes pain. To treat the inflammation that is no doubt dogging your injured shoulder, apply ice for the first 24 to 72 hours after the pain develops. Supplementing with turmeric and fish oil will also ease inflammation. Curcumin, the active ingredient in turmeric, has been shown to inhibit the inflammation associated with arthritis . Fish oil has been found to reduce inflammation and even anxiety  – bonus? I recommend the PuraThrive brand of turmeric supplements. Their products are high quality and potent, check ‘em out. As soon as possible, start performing simple, pain-free movements. Gentle movement will promote circulation, which speeds healing. Use the tests discussed above to determine what muscle or muscles are involved in your injury. As you move forward with your rehab and start to heal, re-testing will be a great tool for gauging your progress. Within 3-14 days, you should begin rotator cuff strengthening exercises aimed at stabilizing your shoulder. Make sure any techniques you do are performed in non-extreme ranges of motion. You should focus on incorporating techniques that involve multiple shoulder positions utilizing isometrics and slow, controlled movements. Here are some great moves for rotator cuff rehab. For the full pushup position, spread feet wider to help maintain balance. A key part of recovering from a strained rotator cuff is restoring how you hold and move your body. You’ve got to restore your posture and your movement patterns – particularly maintaining correct scapulohumeral rhythm. To raise your arm completely, your scapula and humerus must move together in a coordinated way. If this rhythm gets off beat, injuries become more likely. One way to check your scapulohumeral rhythm is to notice if you’re keeping your scaps depressed when performing overhead reaches or lifts. I know you might’ve been taught to do this, but I hate to tell you – you got bad advice. What you should be doing is allowing your scaps to elevate naturally during overhead movements – letting them play their intended part in the scapulohumeral rhythm. Their arms are tight to their heads for optimal aerodynamics, which can only occur with elevated scapulae. Depressed scapulae would slow them down because they wouldn’t be able to get their arms close to their ears. By consciously moving your body in the proper way, you’ll train your neuromuscular system to maintain these new patterns and reduce the chance of re-injury. Lastly, you’ve got to optimize, baby. You must determine individual strength and mobility requirements based on goals and work towards achieving them. Some things you can think about to help you optimize your shoulder health, your body and your life are: What do I want my shoulder to allow me to do? …Weighted pull-ups? Handstands? A pain-free ball game? And, what do I need to do to get there? …Warm up with these stabilizing exercises every day? Tackle the Scap Control Program? Add more weight to my lifting routine? Whatever your goals are, following a dynamic and comprehensive rehab plan like the one above will help you recover so you can get there quicker – and do so without reinjuring that rotator cuff.